Have you lost out on closing the deal because it was hard for you to justify the cost of your website or app development or other digital marketing services? Do you think it is difficult to convince a client to pay the asking price for the expertise and value you offer rather than for just your labour? If you have faced these issues, let me make it clear that you are not alone. Many people find themselves in these situations and are trying to find solutions to ensure the deal is closed. One of the most effective ways in which we try to avoid this is by showing our potential clients the Value Proposition. We study and understand what competitors do when they offer services similar to what Influx is offering. This may be complicated to find out for a specific competitor but it is possible to get an overview within the industry as a whole. We visit exhibitions, seminars and conferences to understand the issues people face when they share their grievances on the levels of services provided. We also keep an eye out for online articles and blogs to understand common sentiments. Once we have that, we position the brand in a way that communicates our research and understanding and how that translates into giving the client the service they expect and want delivered. We see an opportunity and strike when the iron is hot, instead of procrastinating and waiting for things to happen. We concentrate on building long-term relationships, and let people know the value we bring to the table. Product or service, as long as it is high-quality, price is generally not an issue with someone looking to enhance his digital properties. Sometimes this is not the case. When clients are not convinced about the services you provide and don’t see the value they add to their organisation, pricing is the most important factor that will influence whether or not a deal is closed. We call this the “pricing mental block”. However, when potential clients realise the value of what they will receive, price is not the only factor that influences the buying decision. The benefits they will gain by going with your brand become more important than the price. Selling of value is not easy. But, with accurate research, foresight, planning and practice, you can help clients focus more on value and less on price. 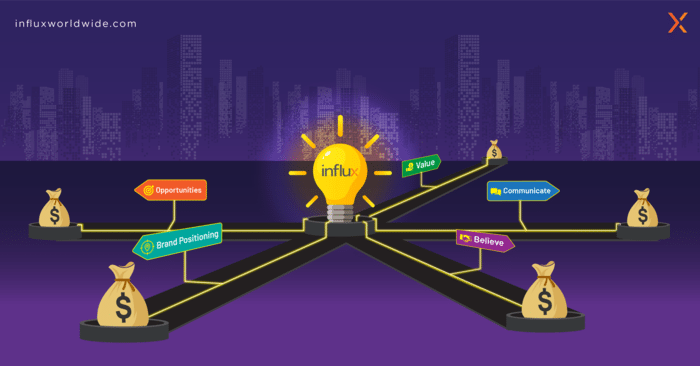 At Influx, we firmly believe that the real power of effective marketing, communications and branding strategy lies in solving a problem and not just present a fancy infographic. There are certain instances where it is difficult to overcome a client’s skepticism and preconceived notions. In fact, developing creative solutions to communications issues and presenting them is where we bring the most value to clients. Some resonate with the client and some do not, but having an in-depth discussion and gaining clarity about his particular need and situation is the best way to align services in a way that clearly benefits his business. This way a clear connection is built with the client who will gain a better understanding about how our services and processes will help solve his business challenges, and hopefully, even accelerate him to places he did not imagine. One of the biggest mindset changes that helps to communicate the value of services extended is to ensure no pricing is mentioned on the website. It encourages clients to contact you and gives you the opportunity to correctly qualify leads and match requirements to the variety of services that you can deliver. It is this conversation which ultimately seals the deal. It ensures that the client is convinced that the value and benefit he will receive equals or outweighs the overall cost. It is critical to discover your clients’ grievances and offer solutions. This shows you understand their needs and, as a process, can be an effective way to not only communicate your expertise but also build mutual trust with people. The key for any service provider is to have an clear understanding of what potential clients need, and communicate how that requirement can be addressed. Often, that means identifying and understanding grievances, clearly demonstrating empathy, and then offering a solution to end that pain. Blog comments and social media engagement can be used to build engagement with readers and potential clients and establish a level of trust and understanding which could ultimately lead to referrals and sales. When Influx meets with prospective clients, we ask them to discuss their business goals and whether or not their website, social media presence and digital marketing efforts are helping them achieve those goals. We probe to uncover any problems they may be having and then focus on selling services which will offer solutions. For example: if we provide a Return On Investment (ROI) analysis with a proposal for a website redesign that automates business processes, the ROI will help the business-owner understand the financial value of his/her investment and the deal can be closed without much fuss. One of the biggest stumbling blocks many individuals/organisations face is lack of clarity about the value they offer. If you do not value yourself then no one else will; you’ll end up being perceived as mediocre. Working through this step is essential and can improve sales and profitability in a few years. Confidently communicating value to people is extremely important to bring in the right sales. You need profitable sales to keep your business thriving so you can continue to serve your clients. The above are a few strategies that we use to communicate how our services can add value to a business. Providing solutions to problems, picking the right opportunities, fixing the appropriate price and setting up qualified prospects with the best services are some measures you can use to improve sales and profitability. At any rate, always be prepared to express your value. Sulil Madhok is our very dapper Head of Business for Influx in India. With over twelve years’ experience in client acquisition, market tendency research and event-management, he is very into technology and travelling.